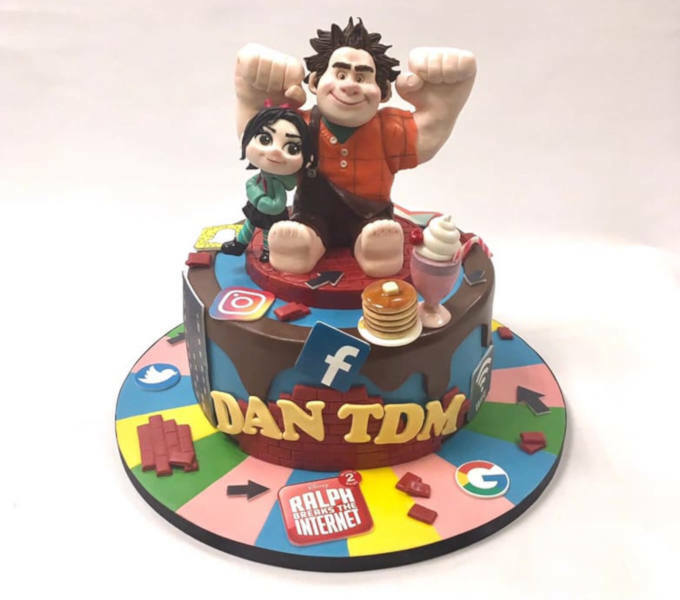 We were delighted to be able to make an awesome Wreck-it Ralph Disney cake for professional gamer and YouTube star, Daniel Robert Middleton, known online as Dan TDM (formerly The Diamond Minecart). The cake, commissioned by Disney Studios, was, we have to say, one of our best Disney cakes yet! We hope Dan loved it as much as we enjoyed creating it. As you can imagine we are thrilled that our cake made it into one of Dan’s vlogs. Minecraft player and gaming commentator Daniel Middleton has become a hugely successful YouTube star, reaching an incredible following of over 20 million fans! Last year Forbes reported on Daniel as the world’s highest paid YouTube star of 2017. He is the most subscribed YouTuber in the UK. Daniel may spend most of his time in the pixelated world of gaming, but he does occasionally try his hand at real-life stuff, like making cakes. In this YouTube clip you’ll not only see some great coverage of our Wreck-it Ralph Disney cake, you get to see Dan-the-cake-man in action in the kitchen. Despite his confessed lack of previous cake baking experience, Dan does a pretty good job of making a chocolate cake. We implore him to come and see us though for some lessons in cake icing. The butter icing bit didn’t go so well. Oh dear Dan. What happened? If only he’d called! We could have given him some cake icing tips! A chilled cake and room temperature butter icing works best. Otherwise (as Dan discovered), the cake simply breaks up as you try to smooth the icing on. The texture of butter icing also needs to be just right (we have a secret method to make the best butter cream ever). On a plus point, we love that Dan created blue icing to match the colour of his hair, and crafted the cake into a diamond shape before icing. We love the blue diamond cake idea Dan! The icing catastrophe didn’t ruin the day. The cake tasted great and got the thumbs up from Dan’s wife, Jemma, and let’s face it that’s the most important thing about any cake!